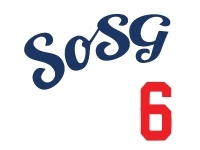 Sons of Steve Garvey: "The One Good Thing That Came Out Of This Blog"
"The One Good Thing That Came Out Of This Blog"
There's a lot of reasons why, seven years ago, we started this blog. To make a repository for thousands of emails that would inevitably be sent anyway among a small group of friends who happened to be Dodger fanatics. To provide an outlet for writing for some amateur journalists who, in a former life, might have pursued the craft, rather than being stuck in fields which do not cultivate the written art. To build a community where Dodger fans young and old, rich and poor, crazy and sane, could bring healthy doses of sarcasm and enter a virtual bar of sorts where snark and sarcasm were encouraged, alcohol was ever-present, and commentary was always fresh. Never, in my wildest dreams, however, did I think Sons of Steve Garvey would do this. "Franklin Stubbs," formerly known as "Mr. Customer," was one of the SoSG regulars from the start. Witty, erudite, cutting, and full of rapier-wit sarcastic comments that evidenced his worldly experiences and literary depth, Stubbs was always a really fun guy to have hanging around a GameThread, whether we were talking about the game itself, riffing on a string of bad puns, or making reference to an obscure European royal. When it came time for Stubbs' call-up to the majors, it made a lot of sense; we appreciated Stubbs not only for his encyclopedic knowledge of the Dodgers, but for his facile mind that made him a great teammate for online puzzle hunts. Through attendance at SoSG Fests, and a couple of late night puzzle-solving sessions, I've gotten to know Stubbs a bit, and he's a pretty cool guy. Stubbs picked up the PCS and, despite being pummeled by work, has continued regaling us with his enigmas this season. Stubbs, as a fellow Son, is like a brother of sorts to me. karina popped up on the blog sometime early in 2008. Like a pack of acne-filled junior high kids who don't know how to talk to girls, most of us frequenting Sons of Steve Garvey found a girl's presence refreshing, intimidating, and curious all at once. Through the course of karina's regular attendance, coupled with the emboldened nature of blog commenters shielded by anonymous handles, we got to find out bits and pieces of karina, all of which helped build her mystery. She hailed from Maracaibo, Venezuela. She loved baseball, specifically Aguilas de Zulia as a local team, and of course the Dodgers, about whom she was quite knowledgable. She suffered through power blackouts and the pregnant pauses of mlb.com GameDay to track the Dodgers' progress, and reveled in the rare occasion when the Dodgers were actually carried on international television. We all loved having karina part of our community. Apparently, however, some of us loved karina more than others. And the wedding was really fun. Orel and I were lucky to get some great quality time with Stubbs and karina during dinner, which included Ardbeg scotch--I'm a big fan! And the six of us (Orel, Mrs. Orel, Sax, Mrs. Sax, Stubbs and karina) were having so much fun hanging out and talking about the Dodgers, that Stubbs' mom actually had to ask them to circulate to the family tables! It was quite a fun evening. Throughout the ceremony, I kept thinking how random this was. Here we are, watching two people join in holy matrimony, as they happily take vows to spend the rest of their lives together. They looked giddy and in love. They're united in their passion for the Dodgers. The two of them, and their families, came together to celebrate the marriage of the two main characters, but also their relatives, their cultures. And our crazy little blog helped bring together these two lovebirds, bridging 3349 miles of distance (that's 5390 kms, karina). A lot of cool things have happened to me because of this blog. I've gotten press credentials to Dodger Stadium, allowing me access to the field for batting practice, the press box during the game, and the clubhouse post-game. I've gotten press access on the road, covering the Dodgers at Busch Stadium for an amazing come-from-behind victory. I've met a host of Dodgers players and front-office executives. I've talked with Ned Colletti. I've toured areas of Dodger Stadium many have not seen (and not just the secret urinal rooms). I've amassed even more swag for my Dodgers memorabilia collection. I've even gotten scoops from the Dodgers PR prior to it going public, if at all. But I never thought I'd see the blog unite a Dodgers couple in marriage. That absolutely takes the cake. Sometime during the reception, Mrs. Sax looked over at me and smiled. Mrs. Sax has put up with my incessant late-night stints at the laptop while typing about a sports team whose draw on my time and mental energy has to be frustrating, if not altogether insane in its apparent (albeit not actual) prioritization (it's only six or seven months of the year, honey!). She smiled and, like only a baseball widow could articulate, said, "So this is the one good thing that came out of this blog." But even if I never get another perk from writing this Dodgers blog? Stubbs' record may only list 602 hits, but I think this qualifies as getting to first base. Congratulations, Stubbs and karina. All of the happiness in the world to you both. And GO DODGERS! DAMMIT, got something in my eye. Damn, Mrs. Sax lowered the boom with that comment. Both poignant in that moment yet still a dagger to Sax's blogging efforts. Tough crowd! Stubbs is swinging for the fences there. I like it! Congrats to the happy couple. Love is a spirit all compact of fire.....and sometimes whiskey. If only I could have been there to pass out. Stubbs didn't strike out. Way to go,mang! Sax: This ranks up there as one of your best. Right there with the mustang. So awesome! Congrats Stubbs and Karina!